theatre of noise: The End of Democracy in Europe? The French and the Dutch shot down the Constitutional Amendment. Ireland said "NO!" to the Lisbon Treaty. So now, after spending millions of our own euros to convince us we were wrong, the government is asking us again. Because they are not happy with the people voicing their will. They will not be happy until it is their will that holds sway. Again we must say "NO!" in the Constitutional Referendum, to preserve democracy, to preserve the Irish constitution and to preserve a valid plurality of expression in the EU. 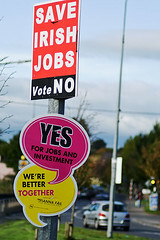 In recent weeks both sides of the campaign have been bombarding us with propaganda. The "Yes" side tells us that we are "safer" in Europe. They tell us we will be second-class citizens if we do not vote "Yes", even though there is no threat of this. Are France and Holland now "second class"? Both sides rush to tell us the economy will magically improve if we vote their way. It was big business and big government that squandered the resources the EU put into Ireland, wasted the opportunities of the Celtic Tiger and have put us in the current dire mess, one that goes far beyond the world-wide recession. 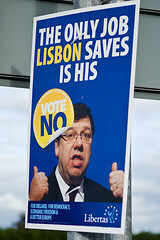 How is the Lisbon treaty going to effect them? Is it going to ask them to repay all their profits and back-room dealings? No, certainly not. Meanwhile the "No" side uses racist fears of foreigners rushing into Ireland. One pamphlet speaks out against Turkey and illustrates this with a picture of the farmyard animal. Disgraceful! The first time around some of these brain-dead politicos used the scare tactics of abortion, now they resort to degrading people of other nations. 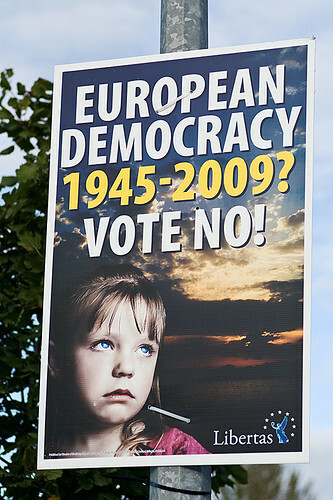 We have also been treated to the ironic display of Sinn Fein campaigning against the militarism of the new EU. Is there any truth to any of this baffle-gab, from either side? Precious little. The truth is both simpler and more mysterious. The very reason we have a referendum is that the constitution of Ireland will be changing. That's why it's called the "Twenty-eighth Amendment of the Constitution of Ireland Bill". It is the structure of our country, not just the EU, that is up for grabs. Please think about that for a moment. But how will the constitution change? This is something no-one will tell us. The Treaty is a long and impenetrable document. So who will interpret this document? Why, the EU of course! We are being asked to vote on a pack of deliberately obscure changes, allowing those who will most profit from the changes to decide what it really means. Astounding! But one thing is clear. If Lisbon passes there will be no more vetoes in European decision-making. There will be no more consensus; instead it'll be majority rules, little guy suffers. And the Irish citizen will never be called upon to vote again -- all those decisions will be made for us. Like I said the last time around, Vote No Or It's The Last Vote You Get. Vote "No!" because we did before. Vote "No!" so our voice is not ignored. Because unlike this pack of rogues and scoundrels, we really mean what we say. We know what we want and will stand by our word. In the spirit of full disclosure, I should note that I am not allowed to vote on this EU issue, even though I have been a member of the EU from the day it was formed. That is because I am a member through a different country, the UK. I would have to go to the UK to vote. But of course they were criminally denied a plebiscite on this issue, after being promised one. So I can vote in municipal elections, in federal elections; indeed, for any position that comes up in Ireland. I can even run for election. But I cannot vote on EU issues! Bizarre. Q:The End of Democracy in Europe? I don't know yet when is the funeral. It seems that now depends on the Czechs. Thanks for sharing such unique article here. It is interesting blog here. I like this site and will visit this site in future too.